Do I have to get flamed for another "go back and look at the posts" "or use the search function"? Like it finding your post here? 1005 we can safely say was the pilot for the rehab job, to see what it actually would entail before series production began. Normal practice, just in case there are any "surprises", they can be dealt with before 1029 of something is ordered that will not work. If the 4000-4207 job is "turnkey" by definition it means an outside general contractor who would then be fully responsible for rounding up any subcontractors, parts, etc. 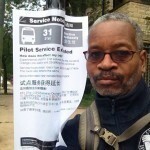 CTA sends unrehabbed bus to contractor, gets fully completed, ready to roll bus back. This is how the 2200's were handled by Alstom. I'll admit to being too lazy to search out the specs. Will buses > 4150 retain all the aisle facing seats? This is how the 2200's were handled by Alstom. And what is your source. They looked pretty updated to me. And where's your source that they were rehabbed? The source that indicates that that was not a rehab on the MAN 4000s and simply a new paint job was CTA itself when it explicitly stated the midlife rehabs of the 4400s to extend their operable service lives were the first time they've done such a procedure for any bus model. Did anyone change any of the seats in the 1000s? Basically, they don't affect whether a bus can go 500,000 miles. Probably still depends on whether there are dedicated Jump buses. 2200's were "rebuilt" to a much greater extent than 2600's were. Who did them, MK? MK did some really good work rebuilding several New York subway car series. Too bad they bit off more than they could chew and went bust over it. MK did a really nice job on the 2200's - new interiors, new ac. From pretty mediocre cars they became really nice cars. The 2600's you could only tell if it was rehabbed by looking for the Alstom plate. 1000's are starting to show their age again. Many transmissions are starting to grind again, ac failures are starting to show. Many small things associated with an old bus.
. The 2600's you could only tell if it was rehabbed by looking for the Alstom plate. There was other stuff, such as that the conductor position door controls were taken out, but the wall lining seemed to be replaced instead of patched. The question also is whether the full width cab partition was added at that time. And don't forget the most obvious indicator to add to your point that Andre is understating some things, going from charcoal gray trim windows and thin red, white and blue striping to the current all silver body. That big change to the exterior is what made you look for the other work in the rehabs. Which, in fact made them more noticeable, as the only things really noticeable on a 2200 (other than the NY Rali Car placard) were the hopper windows and that the seats were swapped from bench to plastic shell. In which case, I have to retract the MK. I got it confused with the single unit car rehabs. Chicago-l.org source on the 2200s. The conversion to one-person -operation was completely separate. Wasn't all done at the same time, if I remember. First they installed the extra door controls at the cab end, and had a yellow strap across the front, then later the conductor end controls were removed and full width cab wall installed after the "subway conductors" were eliminated. Does anyone know when the rehabs on the 4000's are suppose to start I heard it was sometime in early 2017 and have they even decided which contractor is going to work on the rehabs? Did anyone discover what was the deal with #4099, the one jump bus retrofitted with new led lighting inside? i forgot all about it. It's still on the Contract Opportunities page with a bid due date of 10/28/2016, so it isn't yet. Using Maths 22 tracker I have been monitoring buses in service since 2/1/2016 three times a week at 8am and 4pm (usually MWF). This does not include 4167, 4323 and 4332 reported withdrawn. All other 4000/4300 have been in service on bus tracker since 28th October 2016. Hmm these artics are from all four garages (that were artic garages at the last time these were noted in service. Each garage's shortage from these sidelines appear to have been 4 artics per garage. The line of artics that folks reported seeing at South Shops then were not all from 103rd, but from all garages that had them. So basically based on this, there appears to be confirmation of my prior hypothesis that 103rd's troubles were from artics being down at the same time for short term maintenance rather than long term as this confirms analysis of the tracker showing 103rd's rush hour artic usage averaged roughly a 4 to 5 bus drop during late fall compared to that of summer. Given observations that Kedzie, North Park, and 103rd's artic usage hasn't changed much beyond what their normal average artic use tended to be before the Chicago artic purge, 103rd's artic gain basically served to plug the hole. 4102 which has been out of service since May 2015 was out on the J14 both morning and afternoon rush hours on Friday. I was on a 4000 [don't remember the number, but it was a 22] at the end of December, which had all new seats, but they were still in the same wretched sideways layout. The tall metal framed seats with the weird backs had been replaced with blue plastic seats with shorter backs. Could this be a replacement of the 4One Aries seats with the AMSECO InSight seats? Or (choke) AMSECO 6468 seats? 4042 back in service 1/18/17, 4102 1/27/17, 4174 1/4/17, 4189 1/11/17.